I love Girls’ Night Out! I almost never pass on an opportunity to spend an evening talking, laughing, and sometimes crying with friends.And I’ve always wanted to gather all of the wise women I know at once and sit them down in my living room, so we could hash out all of life’s issues regarding marriage, mothering, heath and beauty, homemaking, working, shopping, fashion… etc. We could stay up late and talk long, sharing our experiences and what God has taught us through them. Wouldn’t that be fun? Never mind the fact that I can’t stay up much past 9:30. So, I sought out some of the coolest and wisest women I know from all ages and stages of life and gave them a list of questions. I asked each woman to choose five of those questions to answer and share. AND…I’m inviting you! 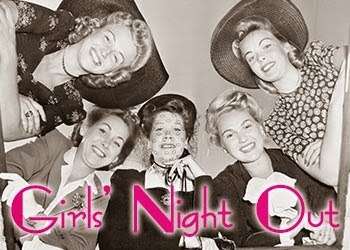 Every night in October, I will be hosting “Girls’ Night Out” and I’m hoping you will join us. Would you please? Don’t you want to kick off your heels, curl up with a cup of tea (or glass of wine), and glean some much-needed wisdom from some God-fearing women? I know I do! What a great idea! I can't believe I missed yours during the 31Days. I am going to bookmark this and come back and read all these words of wisdom in Nov. I love this idea! Congrats on finishing well!